If you live in Japan and are looking to lower your household electricity bill, you might have to empty your bank account first. 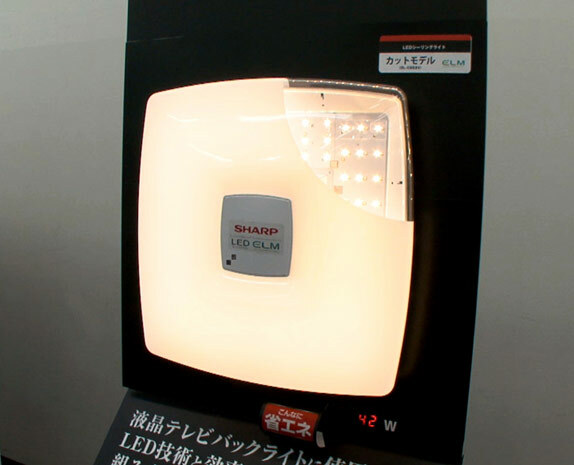 Sharp recently introduced its new line of ELM-branded LED ceiling lights and the highly energy-efficient, square-shaped bulbs won't come cheap -- retailing between 35,000 yen (about $456) and 55,000 yen (about $717). Pulling inspiration from the LEDs used in LCD televisions, the company was able to achieve an industry-leading 81.3 lumens per watt for the smallest of its three designs, and an average life of 40,000 hours for the entire lot . The energy-sipping set of overhead bulbs come housed in an insectproof shell, offering over 100-plus ambient light settings, controllable via remote. You can snag these utility-friendly lights on August 27th, just don't complain at the checkout when you see the price -- we warned you. Peep the video explanation after the break. Sharp's energy-efficient LED ceiling lights are hip to be square originally appeared on Engadget on Thu, 11 Aug 2011 05:36:00 EDT. Please see our terms for use of feeds.